2.9 9:50 Leave Canada Trust, my morning errands completed, and now I’m ready to set out for the border. It’s a lovely sunny day, 70° at 10 o’clock in the morning (I think it said 21 Celsius) . Traffic is not as heavy as I have seen it sometimes and is moving along very nicely. 10:05 Passing the exit that Anna takes to go to work. That’s only 15 minutes, I think, from Canada Trust. Gas In Vancouver is 109.2¢/liter. 28.6 10:25 A detour right here in Cloverdale, the road is closed - Sign: Police Incident, and now I don’t know where I’m going!! 29.4 10:27 I’m back to where I was and I’ll try turning left this time. Just going around in circles and there’s absolutely no signs showing how to get to the highway and the poor truck drivers are confused, too. Everything’s a mess. There are some wonderfully interesting statues and sculptures here in Cloverdale in the downtown area. 30.4 10:38 The road has just been opened. I had pulled into a parking lot, not knowing which way to go next. 30.6 10:39 Stopped at BC-10, I think it is 56th Avenue, for the traffic light and there’s a big heap of sand covering the road so I think there must have been a crash here! What a shemozzle that was, trucks not knowing which way to go, some turning left, some turning right, getting absolutely nowhere, so the whole town was a real big mix up. Lighted sign across the road: Approximate delays across the border - Pacific crossing 60 minutes, Peace Arch 2 hours. 37.4 10:49 I’m stopped in the truck lane trying to get to the duty free. 37.7 11:02 - 11:17 Duty Free. 11:18 Finished at the duty free and stopped in line waiting to be directed into the main line for crossing the border. There were a lot of people in the duty free as well and a long line for the cashier. Now there are 5 lines of vehicles trying to leave the duty free and somebody is organizing all the lines. I’m the fourth line over, so until the other three lines clear I won’t be moving! 11:55 A few cars in my lane moving towards the exit from the duty free - so I’m still not out in the main line. Now I can see 4 other lanes of traffic to my right and three that aren’t empty so they must have emptied all those and have started to refill them. 37.8 12:03 I’m now the first car in line to leave the duty free. 12:12 Finally I’m now joining the main line: actually there are two lines leading up to border and they spread out when it gets closer. 38.0 12:23 Through Customs and now on my way to Ferndale, my next stop. Gas 277.9¢/gal at the Blaine store where I usually get gas, but I don’t have to get any until Ferndale. 50.7 12:35 Leaving the highway at Exit-263 to go into Ferndale. 52.4 Hanging baskets like you wouldn’t believe in the main street here in Ferndale. The bank has moved to the station, so I’m looking for that now. 53.1 12:44 - 12:52 Wells Fargo, Ferndale, WA. Well that’s that chore done and now I’m on my way wherever I’m going! I was thinking of getting gas here in Ferndale but it is still showing half a tank so I might as well wait until a bit later and take another break. 96.3 Speed limit is 70 mph, but at that point the traffic became quite heavy and just after that there was a sign for right lane was closed, hence the sudden stop. 118.5 1:55 Entering Everett. Exit-194 is for US-2 east to Wenatchee and I have decided to take that route for a change. 123.4 2:00 Leaving the interstate at Exit-194. 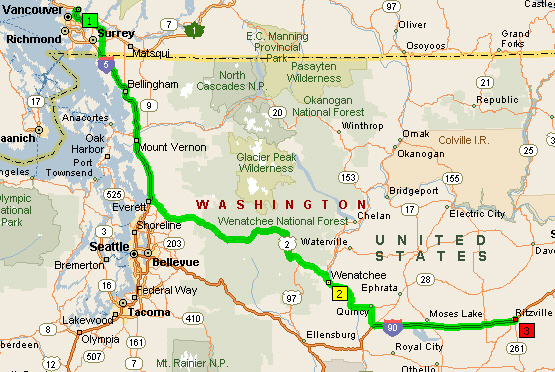 132.9 2:10 Wenatchee 118 miles, Stevens Pass 56 miles. 151.8 2:49 Entering Gold Bar, El. 200 feet - Gateway to the Cascades. 154.8 Crossing a rocky stream ... the mountains are steep, very precipitous sheer rock on my right going up to point. There are a few odd patches of snow. The road is following the valley of the river, the Skykomish River, and the size of some of the boulders in the river is huge. 160.1 Passing the turnoff for a place called Index. 162.1 Entering Mount Baker-Snoqualmie National Forest. 163.6 By the GPS the elevation is up to 705 feet now. 165.7 El. 740 feet ... Seeing large stumps which I think are evidence of an old growth forest. 170.8 Going through a small tunnel and the mountains are precipitous rock cliffs to the left. 173.5 Passing the turnoff for Skykomish ... passing the South Fork Skykomish River. 174.9 Use the right shoulder to instal chains. 178.7 Three chain up areas. 183.2 Last chain up area right now ... fireweed blooming, also tansy. It is incredible that so much logging has taken place on the mountain slopes because they are so steep, but probably the logs were just rolled down. I just can’t imagine working up there to cut them down. 185.6 Just completed a big loop and now the road is going back to the west before it turns north again. I could see the cut along the mountain side as we were going east and I thought it was a logging track, but here it is a four lane highway divided, by double yellow lines. 186.7 El. 3,000 feet and the road is curving to the north east, incredible mountain scenery. 188.4 El. 3,600 feet as the road curves back to the east. 189.8 Passing the Stevens Pass ski area (El. 4,056 feet) and now Leavenworth is 35 miles. 193.8 The road divides but I don ‘t know for how long. 202.7 3:41 - 3:45 Pulled off for pictures. 204.3 El. 2,200 feet - visible on the sign along the road. 206.5 A Rest Area just ahead and a sign for free coffee. I’m still drinking the coffee I got at the gas station. 210.8 El. 2,000 feet and Leavenworth is still 15 miles ahead. Now the road is going south. Talk about a winding road east, west, north, south same highway US-2 east !! 216.5 Entering Wenatchee National Forest, crossing the Wenatchee River and the road turns immediately to follow the course of the river, river on the right hand side and it is flowing in an easterly direction. 219.5 For the most part the day has been bright but overcast. However now, there’s some blue sky and sunshine. 222.0 4:08 Suddenly, without breaking any speed limits I have caught up to a string of traffic in front of me. The road continues to wind around just above the Wenatchee River. 224.8 Turning away from the river ... elevation 1,200 feet the speed reduced to 30 mph for coming into Leavenworth, Washington’s Bavarian Village. 225.8 Turning off US-2 to go into the city center. 225.9 4:13 - 4:26 Leavenworth (pastry - $2.43). 226.0 4:29 Back at US-2. Going through the main part of the village was one-way so that worked out well and I’m returning to US-2 now. Waiting at a traffic light to get back onto the highway. 226.6 Crossing the Wenatchee River. 227.0 Cashmere 12 miles, Wenatchee 22 miles as I leave Leavenworth. 228.0 Into orchard country and the orchards have the windmills for keeping the air moving during the winter, but more particularly in spring to prevent flowers from freezing. Lots of places along the highway capitalizing on tourist trade. 230.5 Passing the exit for US-97 to Cle Elum and Ellensburg. I believe that is where Mary and I joined US-2 in 1995, but today I am continuing east on US-2 until it and US-97 turn north to Chelan near Wenatchee. Then I will pick up a Washington road which will take me south from there. Chelan is out the way, but is a place I have always wanted to visit, particularly so I could do the boat trip on Lake Chelan. 232.1 Crossing the Wenatchee River again. 234.9 Interesting rock formations jutting out of the hillsides. Featuring sandstone slabs and climbable spires called "the pinnacles" that reach 200-feet skyward, Peshastin Pinnacles State Park is a 34 acre playground for the outdoor enthusiast. Peshastin Pinnacles is located 2 miles east of Cashmere off of US 2 on North Dryden Road, in the Wenatchee National Forest. 237.7 The hills are becoming bare of forest and they have more grass on them. This is more like the countryside around Ellensburg. There are lots of orchards. 239.7 4:45 Sign: Spokane is 168 miles. The river is just below the right hand side of the road then beyond the river there’s a valley, beautiful green and different textures depending on what kind of orchards are grown or vineyards. 241.9 Now the valley of orchards has switched to the left hand side of the road through the river is still on the right. 244.2 Starting to see some sagebrush. 245.5 4:52 Leaving US-2 and US-97 and taking WA-285 south through Wenatchee. 246.1 Crossing the river and entering Wenatchee, pop. 27,856. Wenatchee, of course, is where Imogene came and won the Granny Smith of the Year. I got in a wrong lane and had to turn left, but I think I can still get to where I have to go. I somehow finished on the wrong side of the river and am in Wenatchee, and now what I’m looking for is the road with a bridge which will get me over to WA-28 on the other side of the river. The confusion was that I thought I had crossed the river when crossing the Wenatchee River. 250.6 The Senator George Sellar Bridge - starting to cross the river, not the Wenatchee, but the Columbia River which is very wide a this point. 250.8 End of the bridge. 251.0 I’m now on WA-28 and driving south along the side of and just above the river, which is to the right - a very or fairly wide river ... passing a park, called Hydro Park ... judging by the size of the river I’m thinking that maybe it is damned downstream. 254.2 Starting to see the walls of volcanic rock, the type of country as seen around Yakima. 260.3 Close enough to the rugged cliffs to see the columnar jointing in the rocks. 262.0 Passing the start of the Rock Island dam, and the river is still fairly big even after the dam though somewhat below it and there’s quite a bit of water still coming though the dam where gates are open. 268.0 This is just after I took a picture of the cliffs to the left of water sprinklers irrigating a young orchard. 271.6 Got a glimpse of a big bend in the river and on the east bank of it there’s another lot of orchards and houses ... no orchards to the right or to the west of the river. 273.3 As the river bends to the right the road is veering left and away from the river. 276.2 As the road curves to the east I believe that was the top or crest of the climb from that valley. Yes it was. 277.1 Entering Columbia Basin Project and immediately after that the young orchards have post and strings or wires through them so that the trees can be splayed rather than grown up big and round ... easier for picking. 279.6 Huge cold storage sheds for a half mile to a mile ... the left of the road. 280.3 Quincy Opportunities Unlimited. This is as I enter Quincy ... and the cold storage sheds continue. 281.3 5:40 Leaving WA-28 east to turn south on WA-281 to George and I-90. Beautiful display of flowers along the street in Quincy - a long bank of flowers with low ones at the front and gradually getting higher with the tallest ones in the background so it looks like a wall of flowers. 282.5 George is 9 miles, Moses Lake 37 miles. There is a lot of agriculture along this route, and there was a sign that the names of crops could be seen in the fences. So far I haven’t seen very many fences but I have seen a variety of crops. A sign for field corn on the left. I guess this as opposed to sweet corn. 287.5 Many fields of hay, that which has been baled and there are fields where it has been cut but not raked or baled ... huge hay stacks. 289.4 Turning off WA-281 for the junction with I-90. There’s car here in the ditch, it having been driven off the corner, and a group of young people, about five or six of them, wondering if there is anyway they can get the car back on the road! 289.8 5:49 Moses Lake is 29 miles, Spokane 138 miles. 291.5 5:52 Junction with I-90 at Exit-151. 304.5 6:02 I was going to watch for 6 o’clock but it’s now 6:02, 304.5 miles since leaving Stu’s and Holly’s and in that time it took from 9 o’clock to 12:30 to do 38 miles and get across the border and through Customs, a long time, and in the last 5 ½ hours I have traveled from the border to almost being in Moses Lake. 315.1 6:11 Entering Moses Lake. 316.0 Crossing the lake and immediately at the end of the bridge is the exit to go into downtown Moses Lake. 317.0 Start of the causeway across the second arm of Moses Lake. A black or dark bird about the size of a crow flying overhead - about the first third of its wing tips are white. 349.0 6:38 Ritzville 13 miles, Spokane 74 mile. I’m going to try and get a motel at Ritzville. Ritzville is the next two exits. Exit-220 is where US-395 south goes to Pasco and there’s a Best Western at Exit-221, so I will go to the second exit. 362.4 6:49 Leaving the interstate at Exit-221. 363.2 Best Western, Ritzville, but they have no vacancies. 363.6 7:04 Room 109 - parked for the night. I walked across to Perkins for supper - I wasn’t really very hungry so have saved some of my dinner for tomorrow. 364.3 7:16 Junction with I-90 east and Sprague is 23 miles. Sprague is where Jo, Sam and I camped when we were returning from expedition to Alaska in 2005. 379.4 First glimpse of Sprague Lake. The countryside since leaving Ritzville has been rolling plains covered with grass, golden in color, and not even sagebrush. There have been some plowed fields, and where there are cuttings for the road you can see that the depth of soil is very shallow. 382.4 Here there is exposure of the columnar jointing in the rock below the surface. 394.5 Starting to see a few pine trees. 398.5 An area with a lot more pine trees. 411.8 Small lake out to my left and to my right a hawk or bird of prey standing beside its nest on top of a high pole. Pine forest down to the lake on one side and rolls of hay and fields on the other side. 415.7 Businesses starting to appear and it’s less then 10 miles to Spokane. 422.0 Entering Spokane City Limit. 425.5 The traffic hasn’t been nearly as heavy as I expected it to be ... 72°. 443.4 8:24 Passing Exit-299, the last exit off I-90 in Washington. Missoula is 179 miles. 453.5 Coeur d’Alene the next 5 exits. 456.5 I thought I was leaving the highway at an exit where the was a grocery store, but I have confused this city with Burley, ID. 473.0 Fourth of July Pass, El. 3,069 feet. 478.6 Speed increased to 75 mph. 506.4 Leaving the highway at Exit-61 for Business I-90 in Wallace. This is the first time I actually will have driven into Wallace which is an historic town nestled in a valley at the foot of the hills and where there are a number of Historical Markers. The interstate here is built up on stilts, similar to I-70 through Glenwood Canyon in Colorado, and is at the level of the roofs of the two-storey brick buildings. 508.0 Lookout Pass is 12 miles ... the road is winding through a narrow valley. 515.1 The road starting a gradual climb and I think it will continue to climb for about five miles up to Lookout Pass which is near the Idaho/Montana State Line. 516.4 Entering Coeur d’Alene National Forest. 520.2 Exit-0 for Lookout Pass, El. 4,680 feet. 520.3 9:54 Idaho/Montana State Line, also the point of a time change from Pacific to Mountain Time Zone, so now the time is 10:54 ... St. Regis is 33 miles. 554.5 11:26 - 11:35 Cherries and nectarines ($6.00) - St. Regis ... 53°. 555.1 11:37 Back on the interstate. 579.0 Leaving the highway for a Rest Area. 579.3 11:59 - 12:09 Rest Area. 579.5 12:09 Back on the highway. 584.7 Evidence of wild fires having decimated the forest ... bird, maybe a falcon, on a nest. 593.8 12:21 - 12:35 I pulled into this parking area at which I have stopped on previous occasions and this is where I bought my carved cottonwood bark figures years ago. The parking area is above the falls in the Clark Fork River ... there is a big rock wall across where the Clarke River flows. 594.5 Back on the highway, but whilst there changing my tape I also took the opportunity of changing the batteries and finding out the power point and cords for charging my camera, so I did a number of tasks. Now I’m traveling along I-90 before getting into Missoula. When the other tape ended I was just saying there was a bird with a nest, (I didn’t know if it was a falcon or what) in a nest on high pole alongside the road. It was then that I realized my tape had ended. 601.2 Another bird’s nest with a resident bird but not a huge bird. 607.7 Missoula is still 20 miles but the valley has opened up a lot now. 618.2 Passing Exit-96 is for US-93 north, also MT-200 west. 626.2 Missoula is in the valley to the right below the road. 627.7 Exit-105 is for US-93 south ... you would also leave I-90 at this point for US-12 west. 629.4 Passing a train pulled by three engines. 632.4 Leaving the I-90 at Exit-109 for MT-200 east. 632.9 Crossing over the highway and Great Falls is 160 miles from here but I’ll be turning off on MT-83 north. It is marked as a scenic route in the AAA atlas. 633.4 Crossing the Black Foot River. Looks as if the big lumber mill here has been closed ... the road is winding around the bank of the river. 639.5 Crossing Black Foot River ... lots of signs for fishing ... a hay bale just fell of a pick up truck and scattered all over the road as it hit. 649.0 Just seen some more white crosses. 649.9 A broad valley with lots of cattle grazing. 658.1 1:33 - 1:34 Stopped for a sign about The Lubrecht Experimental Forest, located in a pull off near the entrance to the Experimental Forest. 667.4 1:43 Turning onto MT-83, Big Foot is 92 miles, Kalispell 109 miles, Glacier National Park 130 miles. 668.4 Another white crested bird on its nest on a pole. 670.4 1:47 Turning around to go back to a sign I had passed ...I thought I might as well go back because I had two large motor homes and several cars in front of me. 671.3 1:48 - 1:50 Interpretive Marker - Blackfoot - Clearwater Wildlife Management Area. 679.3 1:59 - 2:06 Interpretive Sign - Living With Loons. 706.6 2:35 - 2:37 Historical Marker - The Swan Massacre of 1908 ... 4 pictures. I seemed to have lost some footage and I don’t know why because there’s nothing about Swan Lake or the turnoff for Bigfoot so missed that. All sign of the lake has disappeared ... large heard of cattle grazing and fields of rolled hay. 764.7 Passing turnoff for MT-82 to Kalispell ... MT-35 goes on to Glacier National Park is now 46 miles (I think) and US-2 is 24. 766.0 3:30 This is a more major road that I’m on now. It’s been a really lovely day and I’ve enjoyed the scenery all the way. 775.0 A broad fairly flat valley between mountain ranges with lots of hay growing, some crops I think (like rye) and there are lots of farmhouses. 776.2 I just turned off MT-35 onto another road MT-206 to go to West Glacier and Columbia Falls in preference to continuing on MT-35 towards Kalispell. 786.0 3:49 The junction with US-2 and I turned right West Glacier is 15 from here, and I’m thinking that I maybe I should turn back and see if I can get a room at a motel even though it’s only 4 o’clock ... and maybe not! 788.9 3:56 - 4:01 Next marker - “Surrounded By Wilderness” and just beyond this there are people collecting water in gallon jugs from what must be a spring. 789.6 Entering Hungry Horse - sign suggesting a visit to the Hungry Horse dam. I actually visited the dam back in the summer of 1958 during a weekend trip with friends from Ralston, Alberta. 790.1 Crossing the south fork of the Flathead River. 790.4 And another sign entering Hungry Horse. 792.7 East Glacier is 73 miles, West Glacier is 8 miles. 800.9 4:15 Entering West Glacier. 801.2 4:17 - 4:24 An Alberta Visitor Center, West Glacier. 801.4 4:26 - 4:28 Stopped at a motel, but they didn’t have any telephones! I drove back from West Glacier towards Hungry Horse. 801.8 4:33 Leaving the Highland Motel - again no telephone, so now I’m backtracking further. 808.9 4:41 - 4:49 Evergreen Motel - same story “No Phones”, but the woman here suggested the Mini Golden Motel and very kindly called to make sure they had a vacancy, so continued west into Hungry Horse. 812.0 4:53 Mini Golden Motel ... at last a motel with telephones! 812.1 Room 68, but I decided to look for a drug store to buy cough medicine. 5:18 Left for Columbia Falls, the next town west. 817.2 Passing the junction with MT-206 which is where I came out and Columbia Falls is another mile ahead. 818.1 Crossing the Flathead River, and I gather I’m now in Columbia Falls ... 78° here. 819.2 5:29 - 5:59 Smith’s Supermarket, Columbia Falls - cough syrup - $6.69 and groceries $11.56. Smiths Supermarket is also a subsidiary of Kroger so I was able to use my VIP card. 825.5 Back in Hungry Horse. 826.4 6:10 Back at Room 68, Mini Golden Motel, Hungry Horse. 826.4 7:58 Leave Mini Golden Motel, Hungry Horse. I’m in Hungry Horse Montana and I’ll be driving Going To The Sun Highway this morning before going on to Beth’s. 828.6 63 miles to East Glacier. 835.9 8:25 Leaving from where I had stopped to look at and photograph a sculpture of an eagle over an entrance to a ranch. 836.8 Entering West Glacier and from here I turn left for Going To The Sun Highway. If I were to go straight ahead I would cross the mountains via Marias Pass, 5,213 feet which crosses The Rockies just south of Glacier National Park. 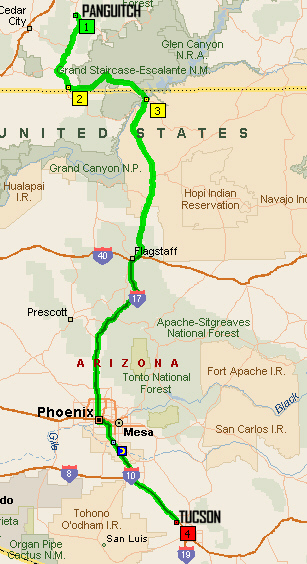 The Marias Pass route is also that taken by the BNSF Railroad. 837.0 8:27 Turn in at the Gateway to Glacier National Park. 838.0 8:30 Stopped to pay the entrance fee, annual pass for Glacier NP only - $35, seven day pass - $25 (cheapest), annual pass - $80. This road, Going To The Sun, was completed in 1932. I tried to find the Visitors Center and drove through West Glacier Village but I could not find it and now I’m driving right beside Lake McDonald. The GPS is currently showing an elevation 3,153 feet. The forest on the other side of the lake is made up of the dead trees left over from the 2003 fire. 848.4 8:54 Stopped for an exhibit on the shore of Lake McDonald - “A Glacial Lake”. 850.0 Moving away from the lake now, and the El. (GPS) is 3,156 feet. 854.8 9:15 16 miles to Logan Pass. Part of the time I am driving under a canopy of trees and at other times I get glimpses of the lofty mountains. Just after taking the picture of the mountain, I’m driving along a precipitous rock wall on my right and a deep valley to my left. This is a bit before I get to the bend, known as The Loop, after which the road starts to go back in the opposite direction at a higher elevation. 862.0 Going through a short tunnel. 862.6 9:40 - 9:53 Parked at “The Loop”. 863.4 9:57 Stopped for about a 10 minute delay for road construction - single lane at a time being led by a pilot vehicle. 10:04 The traffic coming west is just starting to pass me. 10:06 Moving off and just progressing slowly, Indian Paintbrush blooming on the embankment. 864.5 Back to two lanes and the cars going west are waiting for their turn to pass through the construction area. 865.8 10:16 - 10:19 Haystack Creek. 866.4 10:21 - 10:26 Stopped for pictures (ending with rocks and Indian paintbrush) and I have changed tapes before leaving. 867.5 10:30 Leaving after stopping for the Weeping Wall. 867.9 Passing another section of single lane but there’s no waiting line or hold up this time. 868.5 10:33 - 10:35 Stopped for another section of construction - could see a mountain goat on a rocky ledge high above. 870.3 10:42 - 10:52 Pull off for a viewpoint. 870.7 Logan Pass, 6,646 feet - Continental Divide. 870.8 10:57 - 11:13 Logan Pass Visitor Center ... This cough is really playing hell with me. I am finding it hard to breath, so I don’t know if it’s the lack of oxygen or whether it’s the cough that’s effecting me. Now, I’m on my way down. 871.8 Passing another weeping wall. 871.9 Entering a short tunnel ... lots of waterfalls cascading out of the precipitous rock cliffs on the left of the road. 880.1 First glimpse of St. Mary Lake. 882.1 11:36 - 11:41 Pictures of St. Mary’s Lake. 886.0 St. Mary’s Lake is to my right, there’s high mountains to my left otherwise I’m driving through foothills now of the Rockies. 888.8 11:51 Leaving the National Park. 889.3 11:52 Junction with US-89 and I have turned north on US-89. Now there’s another big lake to my left - Lower St. Mary Lake. 896.4 The end of that lake. 896.8 Crossing the St Mary River. 897.9 12:01 Entering Babb and just after that passing the turnoff for Many Glacier Road which goes into the eastern side of Glacier National Park. Cardston is now only 27 miles. 902.6 Cardston is 21 miles. 903.2 12:10 - 12:25 Pulled off for a bite of lunch. 908.7 12:31 Piegan Montana - Leaving USA and leaving Montana. 909.0 12:35 Through the border. I was a bit worried in that there’s nobody else lined up, but he was nice and just the usual questions. 912.1 A hawk sitting on a post, light brown chest, breast I guess is the correct word. The countryside is gently rolling and green ... lots of rolled hay, also cattle. 919.8 Multi-colored, multi-storied bee hives. 924.3 12:53 - 1:00 Cardston, Alberta, Information Center - pit stop, picked up map and made inquiries about a clinic. 924.9 1:05 - 1:57 Medical clinic ($65.00) Although I had been feeling better when I left Vancouver, I wasn’t feeling great so wanted to see another doctor - Well I’ve seen a doctor and I got a prescription for another lot of antibiotics, so let’s hope this does the trick. 925.3 1:59 - 2:18 Extra Foods to get prescription filled. 926.3 2:22 Turning of AB-2 onto AB-5 to Magrath. 928.2 Crossing St Mary River. 933.5 I think I can see the water in St Mary Dam in the distance to the left. 940.8 2:38 Leaving AB-5 to turn into Spring Coulee township road 45 ... all the roads are called either Township Road or Range Road, some of which don’t go all the way through or became impassable, so it took me a while to find Beth’s farm. 953.2 3:05 Arrive Beth’s, Spring Coulee. 953.2 2:00 Leave Beth’s, Spring Coulee, and this afternoon I’m driving up to Calgary to see Pete and Tina. After that I’ll return to The States. It’s a gorgeous day here in southern Alberta, and it reminds me so much of why I loved Alberta as much as I did, the rolling landscape, the crops, the coulees, and distant mountains. It is just gorgeous. 954.2 Just passed Range Road, 253. 2:05 T junction with Township Road 42 when it meets Range Road 234 so turning off 42 onto 234. 958.9 2:12 Crossing AB-5 for AB-505 the cut through to AB-2. 963.0 Starting to cross the St Mary Dam. 963.6 The other end of the causeway and I’m over the dam. 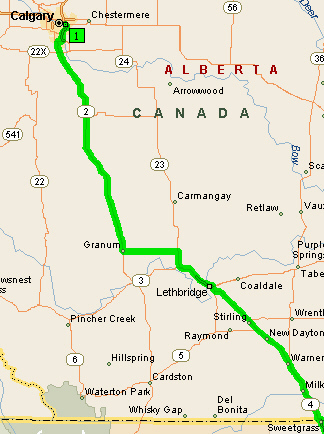 972.6 2:26 Junction with AB-2 and Fort Macleod is 40 km, that is 25 miles. 977.9 Passing Stand Off ... it’s is to the right of the road. 979.2 Fort Macleod 31 km, so that’s about 20 miles now. 980.3 A goose farm on the left. 985.0 The wide open spaces of Alberta! How I love it! Crops or alfalfa, golden crops to the right, alfalfa to the left, no fences, not even any telephone wires, maybe a few road markers. Otherwise it’s just the wide open spaces and occasionally there’s a tree where there’s a house. 992.1 2:46 Calgary 176 km (110 miles). 994.0 A wind farm to my left but it’s such a calm day that none of the windmill seem to be working. 998.0 Welcome to Fort Macleod. 999.0 Passing the old Fort Macleod Fort. AB-2 for Calgary is the next exit to the right. 1,002.3 2:58 Passing the turnoff for Head Smashed In Buffalo Jump, Calgary is 160 kms. (100 miles). 1,024.0 Entering Claresholm, pop. 3,700, El. 3,394 feet. 1,036.7 A working oil pump in the middle of a golden field of grain. 1,085.0 Starting to see lot more homes spread out across the countryside. This is just before the exit for Black Diamond and Turner Valley. 1,090.4 and over the bridge is the Calgary City Limit. The traffic going out of town is pretty heavy but so far it’s still fine in my direction but I’ll probably run into it when I get closer into town for the traffic that want’s to leave the city and go north. 1,102.0 The traffic is getting a little heavier now going my way. 1,103.5 Crossing a river, I believe that is the Bow River again. 1,104.8 More or less coming to a stop. I’ll leave the highway at Exit-256 for Memorial Drive. 1,106.6 Leaving the highway for Memorial Drive. It’s terrible not having the GPS in Canada because I keep looking down at it to see if I’m in the right spot, whether I’m at the right turnoff and all I’ve got is a blank screen. 1,110.5 5:06 Arrive Pete’s and Tina’s. After a good night’s sleep I was feeling somewhat better and took Pete up on his offer to drive me down Memory Lane, that is the Kananaskis Highway. Pete had made a picnic lunch which we had in a very nice area with a great view of the mountains. We also saw a number of mountains ewes along the road. By mid afternoon when we arrived back at the house I was not feeling well again and decided to have a nap. In fact I was feeling so bad I decided to leave next morning and make a run for home. I phoned LP to let him know I was driving home from Calgary and not continuing with travels as planned. Next I phoned Jo to tell her what I was doing and that I would not be seeing her and Sam in Wisconsin. Tina leaving to get gas, but going via the shop where Pete was leaving his car for service, so she could bring him home. Tina tried to convince me that I should stay with them at least one more day, but all I wanted to do was go home! They took my car and filled it with gas so that I could set out with a full tank. Because there had been a fire at one of the refineries there was a shortage of gas in Calgary and some of the gas stations had run out. Pete and Tina didn’t want me leaving without a full tank. 1,110.5 Tina leaving to get gas, but going via the shop where Pete was leaving his car for service, so she could bring him home. 1,115.4 Car back at the house. 10:34 Leaving Pete’s and Tina’s and I’ll be heading straight, figuratively, to Tucson. I’ll have to retrace my steps towards Lethbridge because I’m not going to do any more gallivanting , just heading for home. It is a beautiful day and hopefully I will survive long enough to get a reasonable distance before day’s end. I am much later leaving than I hoped but nobody was in a hurry for me to leave! 1,135.3 Crossing the Bow River. 1,138.7 According to the GPS home is 1,670 miles! 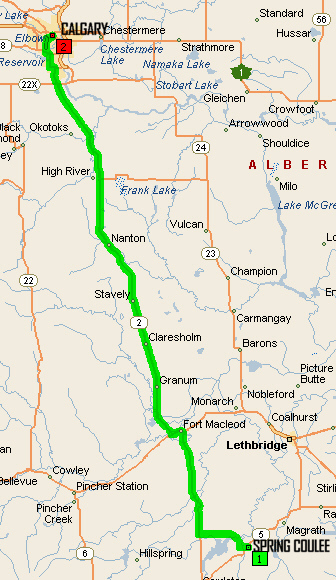 1,148.8 Lethbridge is 171 km (106.3 miles). 1,223.5 Crossing the Old Man River and Fort Macleod is just 3 km (1.9 miles). 1.224.0 Passing the exit for AB-3 to Pincher Creek and Crow’s Nest. 1,224.9 The junction of AB-2 with AB-3 just before coming into Fort Macleod. 1,242.4 Crossing Old Man River. 1,254.4 The road is about to dip down into the river valley and I just got a glimpse of part of the high railway bridge. 1.255.1 Around a corner and there’s the high bridge for the railway. 1,255.4 Entering Lethbridge City Limit. There’s actually a train going across the bridge at the moment. 1,256.0 Starting to cross the Old Man River. 1,259.0 12:54 Leaving the highway. I hadn’t done my homework so missed the turnoff for AB-4 which is the road I need, so now I’ll have to head back in that direction. 1,259.8 12:57 I’m at a traffic at what looks as if it could be AB-4. It is actually AB-5 but it goes to AB-4. 1,264.0 Coutts is 100 km (62.1 miles) and that is just before crossing the border. 1,278.0 Great Falls 279 km (173.4 miles). 1,284.3 A series of combines working and harvesting a grain crop. The millage to home on th GPS has remained at 1,670 miles, so it will be interesting to see what it is after I get across the border! 1,312.0 1:47 Passing the turnoff for Milk River, which is a town just to the left of the highway. 1,313.5 1:49 turning off the highway at the Milk River Rest Area and Welcome Center. Whilst here I cleaned the garbage out of my car, used the rest room and I got the GPS turned on again but it’s still say 1,670 miles. 1,313.7 1:51 - 2:10 Milk River Rest Area and Alberta’s Welcome Center. 1,313.9 2:11 Back on the highway and Coutts is now 11 km (6.8 miles). 1,326.3 2:28 Just went through Customs and I have to stop and go into the Department of Agriculture . I had my two apples confiscated - they were New Zealand apples! 2:33 Free to go, I’m just waiting for the GPS to come up to give me a real distance to home, it is still saying 1,670 so it was calculating the distance from the border. Since I have already done 211 miles, from Pete’s and Tina’s to home is 1,881 miles approximately. 1,326.5 2:35 On I-15 south and the speed limit is 75 mph . Great Falls 116 miles. A sign at the side of the road informing travelers that the white markers (crosses) represent highway fatalities. 1,333.0 The GPS is now showing a distance of 1,590 miles so it isn’t reading very well! 1,340.1 A few oil pumps dotting the landscape. Montana is not as green looking as was Alberta. 1,352.3 A sign for the Lewis and Clark trail. 1,360.2 Passing Exit-364 for Business 15 through Shelby. 1,361.8 Passing Exit-363 for US-2. 1,367.3 The road is descending into a valley, but before this the countryside was more or less just rolling prairie. Now there are these hills with a river at the bottom before the road goes up again. 1,368.1 Crossing the Marias River. This is at the bottom of the descent and then the road will be going up on the other side of the valley. 1,394.0 Oil pumps still dotting the landscape. 1,435.0 3:58 Passing Exit-290 for MT-200 to Missoula. It was just four days ago that I was on the western end of MT-200. Also on another trip I traversed Montana via MT-200 from Missoula to Glendive not far from the state’s eastern boundary. 1,447.1 Passing Exit-278 the exit for MT-200 east. Helena is 85 miles. 1,449.1 4:09 Leaving Great Falls, there are mountain ranges ahead and to the left and it is not all completely just gently rolling country. 1,475.5 I’m getting glimpse of the river out to my left, that is the Missouri River. 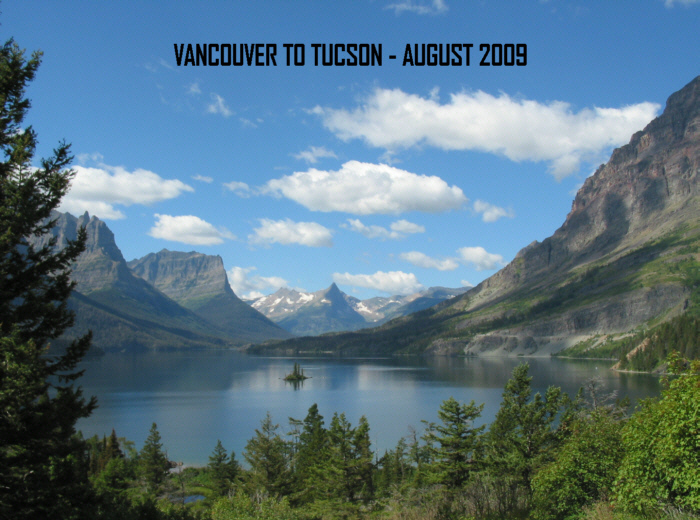 1,476.7 A sign - Big Belt Mountains, the mountain range that I’m going into now. This is a beautiful drive more or less following the route of the river. 1,479.8 Crossing the Missouri River and Helena is now 53 miles. 1,484.6 Crossing the Missouri River again, the road going through a lovely valley with sculpted rock cliffs interspersed with grassy hills. 1,490.3 Crossing the Missouri River, which is now on the east side of the highway. 1,500.7 4:50 With still 34 miles to Helena, the gas light has just come on. 1,522.5 5:06 Over the crest of a hill and a broad valley ahead, there’s a lake and lots and lots of houses. This is going to be Helena that I’m coming into and the road is descending from that point. Billboard: “Take my hand not my life. Abortion kills babies.”. 1,532.5 Helena the next 3 exits. 1,536.7 5:18 Leaving the highway at Exit-190 to get gas, but I think I should have got off at the previous exit because there doesn’t appear to be any gas here. 1,537.5 Back on the highway, but returning to the previous exit. 1,542.4 5:42 Back on I-15. 1,548.0 Butte is 59 miles. I have been seeing a lot of dead trees in the forest as if some bug has infected them and killed them, they look to be pine trees ... not all the trees are infected. 1,556.7 A sign pointing to the left to Elkhorn Mountains. My! There are a lot of dead trees. 1,560.3 Passing a chain up area, which indicates to me that the road ahead is ascending ... according to the GPS the elevation currently is 4,800 feet. 1,564.0 This appears to be the summit - elevation (GPS) is 5,535 feet and as the road winds downhill with a broad valley spread out ahead. 1,566.7 Passing the chain removal area. The road is certainly winding through the mountain range and at times is going north, north-west and west, so it’s not just a straight run down from Helena to Butte. 1,575.4 A flashing light indicating a speed limit of 45 mph on the corner. There are some sharp curves. 1,583.3 Passing Exit-151 for Bernice. 1,586.2 Chain up area in half a mile. 1,588.7 Not sure if this is the crest or not 6,073 feet, then 6,079 feet in half a mile. 1,591.2 Chain removal area. The road is going through a wide valley, lots of green fields, beautiful ranching country, and on each side there’s a backdrop of forested hills or mountains. Looking at the GPS, it appears as if I-15 goes west with I-90 before turning south. 1.601.7 I’m just passing another car and there was sign for the Continental Divide, but I couldn’t see what the elevation is. Since looking at the map Butte, which is surrounded by mountains appears to have the Continental Divide to the north, the east and the south of the city. 1,603.8 Passing the big white statue that’s up on the hill to the left - Our Lady Of The Rockies, a 90-foot statue in the likeness of Mary, mother of Jesus. 1,605.9 Junction with I-90 in Butte Montana, this is also I-90 as well as being I-15. 1,606.9 6:34 Leaving the highway at Exit-127. 1,607.3 6:35 Days Inn, Butte. 1,607.3 6:41 Parked for the night - Room 110. 1,607.3 8:02 Leaving Days Inn in Butte Montana. The sky is dull and overcast and I think it rained during the night. I’m not feeling great so sure will be glad when I get home! 1,607.8 8:04 Back on the interstate which is I-90 west and I-15 south. It is raining. 1,614.1 8:10 Leaving I-90 at Exit-121 for I-15 south. It didn’t rain much but it is a very dismal looking day, very overcast. Great ranching country, rolling hills through out the valley with forested hills as a backdrop on both sides of the valley. 1,624.0 Continental Divide, elevation 5,879 feet. Big Hole Battle Field National Monument at Exit-102 for Divide and Wisdom. 1,633.4 8:25 Passing Exit-102, and it is raining lightly again. 1,645.8 Beyond the first two layers of hills or mountains to my right there is a range which still have some patches of snow on it. I’m still at over 5,000 feet elevation (GPS). Also looking to my right I have the green fields of alfalfa and then bare hills, more or less bare except for a bit of grass and then the next layer of forested hills, which are somewhat higher, and then beyond that the mountains with the snow on. 1.651.0 Crossing Big Hole River. 1,658.4 A sign pointing to the west for Pioneer Mountains. 1,671.7 Dillon next two exits ... there’s Motel 6, Super 8, Best Western, Comfort Inn all here. 1,675.5 Idaho Falls 145 miles, and it’s raining again. 1,687.7 Crossing Beaverhead River ... Pipe Organ Bridge and as I came down the road towards the bridge there were eroded cliffs high up on the mountainside and is probably the feature that gave the bridge its name. 1,692.8 Exit-44 is for the Clark Canyon Reservoir, and I notice as you exit there, you can actually see the wall of the dam or the reservoir. 1,693.4 Now driving alongside the water of the reservoir. 1,705.4 Although I’m still getting some light rain, the sky is looking somewhat brighter ahead and I wouldn’t be surprised if I eventually come out into sunshine. I am traveling south I-15 and I’m about 30 miles north of the Montana/Idaho State Line. It is a lovely highway, not much traffic and going through some beautiful countryside. The next town, which I think will be on the border is called Monida, a contraction of Montana and Idaho. 1,752.8 A sign at the side of the road: Spencer - Welcome to the Opal Capital of America. 1,755.4 Pocatello is 111 miles. 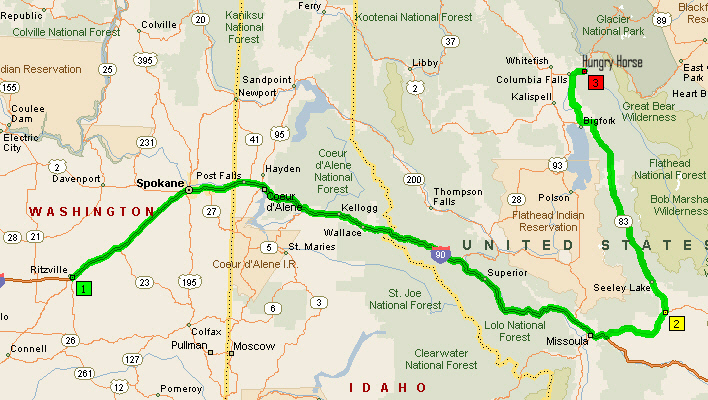 If I remember correctly, as soon as I reach Idaho Falls, I will be back on highway I have traveled previously. 1,756.5 Start of an area with banks of snow fences all of them to the right of the road. 1,761.0 More light rain. The valley is quite broad here and there’s sagebrush growing all over the place, there’s also rugged areas where there’s coulee, rocky outcrops and the mountain range is way over to the other side to the right. Craters of the Moon National Monument the next exit. 1,768.0 Leaving the highway at Exit-167, which is for Craters of the Moon National Monument. 1,768.3 10:10 A stop sign at ID-22 - right turn for Creators of the Moon National Monument. The Historical Marker is in the Rest Area to the left and I think I’ll cross to the rest area before returning to the highway. 1,768.8 10:12 - 10:18 Rest Area ... Historical Marker # 427 - Nez Perce War. 1,769.5 10:20 Back on I-15 and 1,171 miles to go 18 hours and 8 minutes. More light rain. 1,777.3 10:26Sun is trying to pierce through the clouds but not being very successful. 1,795.0 Passing an Historical Site. Normally I would be stopping but because I feel so lousy I don’t feel like stopping at these places, I just want to get home, I’ve done nothing else but cough, cough, cough all morning. 1,810.4 Irrigated fields of potatoes, this is just 8 miles north of Idaho Falls. 1,815.0 A very productive area with grain fields, hay, potatoes - lots of agriculture through this particular area. It is raining fairly heavy so it’s set in now for the day. 1,816.0 Idaho Falls the next 4 exits. Exit-119 is for US-20 east. 1,818.61,879.3 Exit-118 is for US-20 west to Arco. On the way back from Anna’s wedding in 1997, my sister, Jen, LP and I stayed in Arco the night before going to Craters of the Moon National Monument. 1,821.3 Passing Exit-116 which is for US-26 to Jackson, Wyoming. 1,830.7 Salt Lake City 194 miles. 1,834.6 Black volcanic rock or lava both sides of the road. 1,836.3 Leaving the highway for a Rest Area. 1,836.6 Rest Area ... Historical Marker # 287 - Lava Formation. 1,837.2 Back on the highway. 1,843.5 Crossing the Snake River. 1,845.3 Passing Exit-93 for Blackfoot and Aberdeen. There’s also a potatoes museum at this exit. 1,866.1 Passing Exit-72 for the start of I-86 west to Twin Falls. Pocatello is the next 3 exits. 1,867.3 11:40 Leaving the highway at Exit-71 to get gas, also something to eat. 1,868.8 11:55 - 12:09 McDonald’s - pit stop and lunch ($6.88 cash). 1,870.5 12:15 Back on I-15. At present this is also US-30 and US-91 east I believe. 1,879.3 Salt Lake City is 149 miles. Lots of lava exposed on the hillside. Exit-47 is for Jackson, Wyoming, also Lava Hot Springs, Soda Springs, Montpelier, US-30 east. 1,894.3 Passing Exit-47. There was a sign for Logan Scenic route to Salt Lake City next exit, Exit-36 would be the next exit and it would be US-91 also. Logan next right. 1,916.9 Masses of wild sunflowers in the medium and at the side of the road. I have been seeing sunflowers all day, but there are masses of them here. 1,918.0 Malad Summit, El. 5,574 feet. 1,929.9 Lots of agriculture to the right, a broad valley. 1,930.6 33 miles to Tremonton. There I pick up I-84 coming in from the west. Very wide fertile valley out to the right and lots of irrigation sprinklers working in green fields and there looks to be ripen crops. Patches of blue sky but there’s also some light rain. 1,942.0 The sun is now shining through one of the holes in the clouds. 1,942.9 1:10 The Idaho/Utah State Line. 398 miles to the Utah Nevada border, that is on I-15. 1,954.8 Lots of color to be seen in the countryside . Blue sky, white fluffy clouds, yellow fields, green fields, the darker green of the trees, brown mountain sides - beautiful patch work of colors. The amount of traffic has been increasing since Idaho Falls and since Pocatello in particular and I imagine that as I join up with I-84 at Tremonton it will become quite busy. 1,961.3 Tremonton the next 2 exits. 1,963.9 Passing Exit-379 for I-84 to Boise. 1,975.0 Two or three cranes in a field to my right. 1,994.0 A field full of horses, the most horses I’ve seen in any one spot in a very long time. 2,004.3 1:59 Passing Exit-340, which is the exit for I-84 east to join up with I-80 to Cheyenne. 2,047.2 Am opposite Temple Square which is to my left. 2,047.6 Passing Exit-308 for I-80 west to Reno. 2,050.8 Passing Exit-304 for I-80 to Cheyenne. 2,065.3 Las Vegas is 388 miles. 2,090.0 Finally the highway is down to two lanes, the first time since way north of Salt Lake City, and maybe even north of Ogden ! 2,092.2 Speed just increased to 75 mph. The whole area is still fairly thickly populated. 2,098.3 Two lanes of traffic at a standstill going north and I think there must be an accident of some kind I spotted a policeman there but I didn’t noticing anything wrong. 2,105.6 3:30 Back on the highway. 2,119.7 Passing Exit-225 for Great Basin National Park. 2.130.0 The road has switched to the west side of the valley and all the flat area of the valley is cultivated. It has been a beautiful drive but I feel so lousy I’m not much in the mood for describing any of it. 2,142.8 The speed limit is now 80 mph, and a sign indicates that it is a Speed Limit Test Section. 2,156.6 A flashing sign: wildfire near US-50 - there’s thick smoke so take caution. Exit-188 is for US-50 east and I-70, Capitol Reef National Park, also for a chain-up area. 2,160.1 Passing Exit-188. The fire appears to be out to the east. 2,161.5 End of the speed test section, so now it’s back to 75 mph. After that I-15 veers to the south west and rise up into the hills. 2,165.3 Summit, El. 5,970 feet. Exit-178 is another exit for Great Basin National Park also for US-50 west. 2,170.5 Passing Exit-178 for US-50 west and Great Basin National Park. 2,188.4 Another speed test section but the sign was covered due to the road construction, that is the speed sign was covered up. It’s another 80 mph test section. 2,199.0 Outcrops of rock in the rolling hills to the left - it looks a bit like lava outcrops. 2,206.1 End of the speed limit test section, so back to 75 mph. 2,208.6 Speed limit 65 mph for the next 3 miles - this is as the road climbs to and winds through a hilly area. 2,214.1 Summit 6,160 feet. Exit-132 is for I-70 east to Denver. 2,216.9 More out crops of lava rock. 2,217.9 Can see I-70 to my left. 2,218.3 Passing Exit-132. This is where I-70 begins. The previous exit for I-70 was actually for US-50 east which cuts across to I-70. 2,226.0 Summit - 6,600 feet and the gas light has just come on. 2,234.3 A flashing sign: Controlled burn do not report. The signs for the rest areas here in Utah are called Rest Stops and it is indicated that it is private public partnership. 2,249.1 Fremont Pass - El. 6,680 feet. 2,252.0 GPS showing I still have 703 miles to go. I’m recording this at the moment because I’m leaving the highway at Exit-95 for UT-20, then Panguitch and on to Kanab. 2,256.2 5:27 Leaving the highway at Exit-95 (699 miles to go on the GPS). 2,256.9 US-89 is 20 miles, Panguitch 30 miles, Circlevile 38 miles, Kanab 96 miles and there’s no gas station here so I think I should go back to Beaver which is at Exit-112, that’s 17 miles back. That was obviously very stupid of me but I was sure there bound to be gas stations at that cross over exit. 2,271.5 5:40 Leaving the highway at Exit-109. 2,272.4 5:40 Back on I-15 south. 2,279.1 Fremont Pass again. The mileage the GPS is quoting is for me to continue on I-15 down to Las Vegas, I’m not sure after that. UT-20 takes me across to US-89 which goes to Panguitch and Kanab. The exit is also for Bryce Canyon and National Park. 2,286.2 5:59 Leaving the highway at Exit-95 GPS says 699 miles to home. That was too bad about the backtracking. 2286.6 Crossing the interstate. It will be interesting to see how far it is before I actually get to a gas station. 2,286.9 Passing the sign that gives the distances to the various places which is where I turned around and of course the GPS is going the be continually doing recalculations because this is not the route it wants me to take. The road is making a long climb so this makes even more important that I went back for the gas rather than continuing. 2,292.3 6.949 feet, that’s according to the GPS. 2,296.6 7,703 feet and still climbing. 2,296.9 Roadside sign: Summit - 7,920 feet. 2,298.0 In the distance I can see a red rocky cliffs which is the type of country you see in the southern part of Utah at Bryce, Canyonlands, Kodachrome Basin, and Grand Staircase-Escalante. I could certainly see the color in the distance as the road descends down to US-89. Th road descends first in to a valley, then it looks as goes out through a gap in hills. 2,300.9 Turning away from the valley to go through the gap in the hills. 2,305.0 The GPS has done some recalculating and now it says 531 miles, 8 hours and 27 minutes to home, but at the moment I don’t know what route it has planned for me! I am guessing it’s going to be via US-89 through Kanab. 2,307.6 6:20 The junction with US-89 and turning south. Panguitch is now 10 miles and Kanab is 77 miles, so Kanab is not possible tonight. 2,310.2 Several new foals lying in the grass by their mothers. 2,316.7 6:29 Entering Panguitch, founded in 1864, El. 6,600 feet - 80°. Passed one motel and I may go back to that. 2.317.2 The first gas station I’ve seen since leaving the interstate! I’m returning to the motel I first saw. 2,317.6 Parked outside Room 2 ... before turning off the engine I noted that the GPS was showing that I still had 519 miles to home! 2,317.7 6:52 - 6:55 Coffee Shop and Restaurant - not very inviting so I drove around the town looking for another place. 2,319.0 Stopped outside a pizza place and turned around. 2,320.3 7:06 - 7:14 Finished up at a Subway - $6.54 for an 8 inch pepperoni pizza. 2,320.4 7:16 Back at Marianna Inn. 2,320.4 7:25 Leaving Marianna Inn ... 519 miles to home! 8 hours 20 minutes! I have just left from a motel in Panguitch for the last run home. I’m still not feeling well and I’m hanged if I know what’s wrong with me, but I’m a little scared about being as sick as this. 2,328.3 7:37 Passing the turnoff for Tropic, Escalante and Bryce Canyon - this is also UT-12. Kanab is 61 miles, Phoenix 417 miles from here. 2,347.8 According to the GPS I’m at an elevation of 7,224 feet so I’m actually quite high up, near the top of Kosciusko (Australia’s highest peak), and the road is still climbing. 2,349.5 The turnoff for UT-14 west to Cedar City. At the summit - 7,382 feet (GPS). 2,368.0 Going through a town called Orderville and there’s a tremendous amount of color showing up in the cliffs now. 2,372.5 Passing the turnoff for UT-9 to Zion National Park. 2,372.7 Kanab 17 miles, Lake Powell 88 miles. 2,373.0 Crossing the Virgin River. 2,376.2 Passing the turnoff for the Coral Pink Sand Dunes State Park. 2,388.8 Entering Kanab - The Greatest Earth On Show. It only takes a moment to realize what “Greatest Earth on Show” means - you just have to look at the surrounding landscape, the strata and the multi colors of the cliff faces as if someone has etched the mountains and valleys. 2,389.1 8:39 - 8:40 Stopped for road work. 2,390.2 8:43 - 9:25 Breakfast in Kanab. 2,390.6 Big Water 52 miles. 2,391.5 Leaving Kanab. The road is going more or less due east ... to the south it is mostly juniper and sagebrush and gently rolling and to the north high read rock cliffs. 2,406.5 Sign: Grand Staircase-Escalante ... Lots of wild sunflowers along the route. 2,411.9 Summit - 5,690 feet. The colors of the rock cliffs to the north vary at different elevations . 2,424.6 Turnoff for Pariah (Pahreah) Town Site Historical Marker - that was just off the road but I’m not stopping anywhere for anything today. From research on the web the marker itself is actually missing, and Pariah is a small abandoned town and cemetery. 2,430.0 The road makes a sharp left turn through a cutting in the hills and once you do that turn there’s rugged red rock, wild, wild country. 2,436.6 Phenomenal strata in the rocks, some are almost white, some deep, deep reds and lots and lots of coloring in between . The scenery is just breath taking. 2,438.0 Passing the turnoff for Cottonwood Canyon, a 47-mile unpaved road between here and Cannonville where it meets UT-12. This is a route I hope I will have the opportunity of driving next time I am in this area. 2,447.1 First view of water, that is the water of Lake Powell. 2,447.2 10:19 Entering Big Water. 2,449.6 Passing the Cowboy Motel where we stayed September 2008 when going to Ontario. 2,453.1 Entering Glen Canyon National Recreational Area. 2,456.2 The Utah/Arizona State Line - still 317 (GPS) miles to go! 2,463.5 10:37 - 10:51 Glen Canyon Dam Visitor center - pit stop. 2,464.0 Starting to cross the bridge over Glen Canyon. 2,464.3 End of the bridge. 2,464.9 Entering Page El. 4,300 feet. 2,475.1 El. 5,000 feet. I guess it’s another beautiful day with blue sky and a few odd fluffy white clouds otherwise just beautiful. 2,486.4 El. 6000 feet. This is before a safety pullout for trucks to check their brakes and then after that the road goes through a large cutting as it descends down the face of the cliff into the valley on the other side. 2,486.7 Entering the cutting and there are distant views from here. 2,486.9 Through the cutting and the road winds down the cliff now to the base of the valley. 2,490.4 11:20 Passing the junction with US-89A which goes out to the Grand Canyon North Rim, to Fredonia and Kanab. I’ve just realized that being back in Arizona, I’m now out of Mountain Time so that means it’s and hour earlier instead of being 11:20 it is 10:20..
2,492.0 I’m going to change my time back an hour. 2,509.0 Cedar Ridge El. 5,930 feet. 2,519.1 10:47 - 10:48 Stopped for road work, single lane. 2,534.1 11:01 The turnoff for US-160 east to Tuba City and Kayenta. Cameron is 14 miles and Flagstaff 67 miles. 2,548.2 Starting to cross the bridge over the Little Colorado River. 2,548.4 11:15 Stopped for road work ... El. 4,204 feet. 11:17 A pilot car just brought the traffic through from the other side and is turning to lead us up now, however traffic is still coming through from the south. 2,550.0 11:20 End of the pilot car and this is right at the junction with AZ-64 to the Grand Canyon. Semi-trailers, one behind the other, going in the opposite direction, nobody would have a hope of passing them. 2,551.0 Wupatki National Monument turnoff. That’s where Richard and I would have joined this road when we drove to Sunset Crater National Monument and to Wupatki. 2,573.8 Start of the divided highway, but I’m not sure for how long. 2,575.4 Be alert, elk the next 20 miles ... El. 6,000 feet. It looks as if it might be a divided highway all the way into Flagstaff. 2,582.2 Start of 3 lanes as the road goes up hill near the San Francisco peaks. 2,584.9 Junction with I-40 is 12 miles. 2,585.3 El. 7,276 feet. This is just before the turnoff for Sunset Crater National Monument. 2,585.7 Passing turnoff for Sunset Crater and Volcano, and Wupatki National Monuments. 2,587.5 Few drops of rain. 2,588.0 El. 7,000 feet and it’s still a 4 lane highway, but no longer divided. The little bit of rains is from the black cloud hanging over San Francisco Peaks. 2,596.2 12:02 Flagstaff City Limit, Flagstaff El. 6,906 feet, founded in 1882. 12:30 4 hours to get home - 250 miles. 2,599.0 Junction with I-40 to go to I-17 to Phoenix. 2,603.9 Leaving I-40 for I-17. 2,606.8 Passing Exit-337 for Oak Creek Canyon and Sedona. 2,607.1 The elevation is 7,000 feet. 2.611.3 Sign for elk for the next 35 miles and just after that the speed picked up to 75 mph. 2,631.4 Curves and mountain grades for the next 15 miles. 2,634.8 El. 6,000 feet and there’s a wonderful view of cliffs and rock chimneys to the right. 2,642.5 Run away truck ramp is now 2 miles - the first sign for the ramp said it was 10 miles ahead and then the next sign said 5 miles ahead and now 2 miles ahead. I can’t imagine what would happen to a truck that had got away and was a run away truck. 2,644.5 Passing the run away truck ramp. Exit-298 is for AZ-179 north, to Sedona and Oak Creek Canyon. 2,645.6 Passing Exit-298. There are still rain clouds overhead. 2,655.0 Exit-289 ... I think it is, for Montezuma’s Castle. The weather has become very stormy, and there was a flash of lighting ... it is now raining. 2,658.9 It is now raining quite heavily. This just teaming. 2,663.3 The rain has eased a little, there’s still flashes of lighting. 2,669.5 It is still raining heavily so still not out of the woods. 2,697.0 Near the Bumble Bee exit and starting to see some saguaros. 2,721.2 Phoenix City Limit. This is way beyond all the others towns such as Carefree and Peoria. 2,745.8 2:39 Exit-200A off I-17 for I-10 to Tucson. 2,852.1 4:08 Exit-246 Cortaro Road leaving the highway. Now there are storm clouds over the Tucson Range so maybe we’ll get some rain tonight. 2,853.9 4:20 Arrive home. The Texas Ranger is in full bloom as I pull into the driveway. I got home just a little too late to see a doctor. However, I did so the next morning, was sent for an x-ray and discovered that I had pneumonia. I spent the next week in bed!